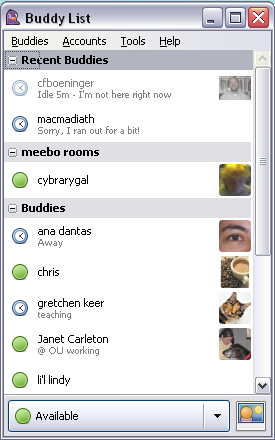 The ostensible promise of Pidgin is that it could reduce virtual reference logins to one application, instead of using Meebo and Trillian simultaneously or two instances of Meebo for both personal and library accounts. We run all of these services plus Skype on an hourly rotating basis in our reference department, meaning that any streamlining of the various accounts and interfaces is a good thing. I started using Pidgin to log into all of my IM accounts as well as my Meebo widgets, and I’ve been quite happy at its performance in this capacity thus far (the notification noises are particularly nice). However, when using it for the virtual reference IM and Meebo while also logged into my own accounts Pidgin has a tendency to crash and bug out wildly, a problem that several in the department have experienced with Pidgin. It seems to relate to login crossover issues caused by some using Meebo while some use Pidgin – transitioning from user to user on the hour proves very problematic, and it’s difficult to determine whether Meebo or Pidgin is the culprit.